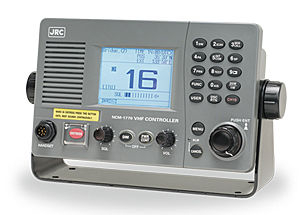 A ships radio is capable of voice communication over great distances. NauticExpo offers different ship radio systems classed by frequency range including VHF, HF, MF and UHF. These radios enable radiotelephone contact between distant stations on a set frequency, or channel. They provide practical ship-to-ship or ship-to-shore communication. Such a radio has at least one semi-duplex channel, a predetermined frequency on which the user can transmit and receive, though not simultaneously. Full duplex models can send and receive at the same time. Some include digital selective calling (DSC) capability. Choice will depend on the radio's range and the vessel's zone of operation. The IMO and government agencies establish minimum requirements for radio communications equipment in different zones. For example, ships sailing in zone A1 must have at least a VHF radio capable of transmitting a DSC message on channel 70.